Every child wants to live out his or her fairytale dreams. This Halloween, make those dreams come true for your child and purchase a costume that’s sure to delve deep into fairytale land. Every child loves Mary Poppins, the most fabulous nanny in the whole wide world. Let your child live out her magical dreams in our English Nanny Children’s Costume. 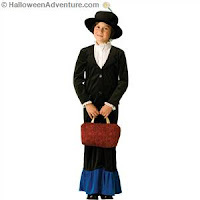 Includes a velveteen black coat with attached blouse and skirt, hat, and a functional flower handbag. Boys can live out their fantasy to be big, bad and scary with our Gorilla Children’s Costume. One part animal, one part Godzilla, this costume includes shirt, gorilla mask and black gloves. Boo! 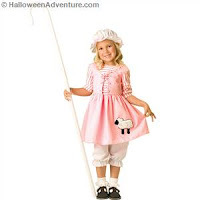 Get your girl a classic with our Little Bo Peep Children’s Costume. Includes a dress with mock vest and sheep appliqué, pantaloons, and mop hat. Little Bo Peep has lost her sheep, and it’s up to you to find them! Whose afraid of the Big Bad Wolf? Not you! 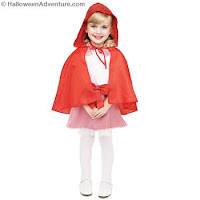 At least, you won’t be in our Little Red Riding Hood Children’s Costume, which includes dress, hooded cape, and detachable collar. This one is absolutely adorable, and goes perfectly with a bucket full of sweets! Girls will love our Neverland Fairy Girl Costume. Includes a green panne velvet dress with rope belt, sheer apron, tatters, wings and wand. We’d recommend you also bring some fairy dust to sprinkle on those around you when you teach them to fly! For more Fairytale children’s costumes, check back to the blog tomorrow, as this post is TBC: to be continued. In the meantime, log on to Halloween Adventures to purchase!